January 31, 2019 at 1:28 pm. 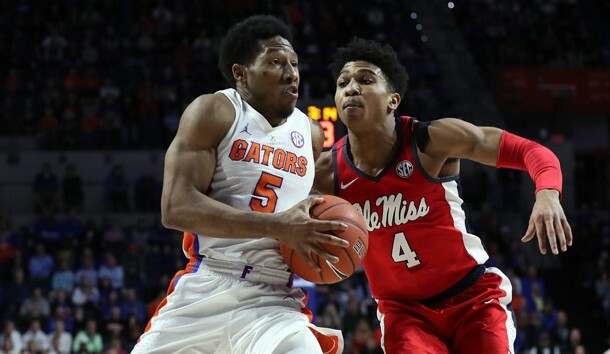 Tension built in the Exactech Arena on Wednesday night where the Florida Gators rode a series of clutch plays by senior guard KeVaughn Allen to a thrilling 90-86 win over Ole Miss in overtime. 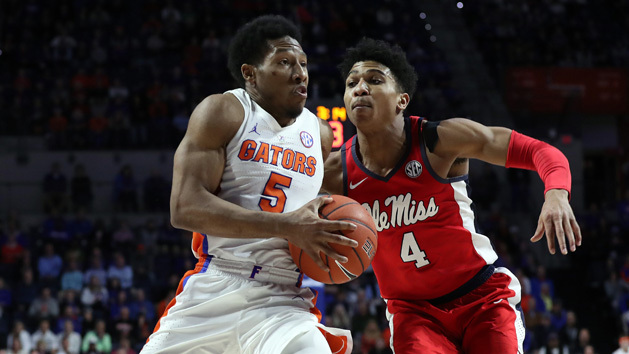 It was a pivotal game for Florida which improved to 12-8 and 4-3 in the SEC, while Ole Miss needed to re-establish itself after losing three of the previous four games since rising into the Top 20 after an 81-77 win at then-No. 14 Mississippi State. Ole Miss had just gone ahead 76-73 on a pair of free throws by Breein Tyree with 8.8 seconds remaining and Florida had called a time out. Gators coach Mike White was looking to free Allen up for a triple. The idea was to create a switch on the perimeter and get Allen a clean look. The switch occurred and Ole Miss’ freshman K.J. Buffen had a hand in Allen’s face. There was hardly any separation, but Allen drilled the triple with 2.7 seconds remaining to force overtime. Allen struggled with his shot all night and did not make a three until his late heroics. He came into the game shooting 53.7 percent from behind the arc in SEC games, but was only 1-of-7 from three. Allen was, however, his usual steady 8-of-8 from the line in finishing with 21 points. White saw growth in Allen whose confidence is minimal at times. The Gators need him to be this type of leader where he will show confidence in the clutch. From there, Florida fought off the pesky Rebels as Allen stepped up with even more verve in the extra session. He had a couple of scores in the lane sandwiched between threes from freshmen Andrew Nembhardt and Locke as Florida built its biggest lead at 86-79 with 2:48 remaining in overtime. Once Ole Miss cut the Gators lead to 86-83 and Bruce Stevens actually missed a layup on a backcourt turnover, Allen once again willed the Gators to the win. He went airborne to the sidelines to retrieve a loose ball which he kept inbounds in the waiting hands of Kevarrius Hayes who immediately found Andrew Nembhard and he made two deciding free throws. Freshman Fervor: Florida forward Keyontae Johnson disagrees, but he seemed to have his best game of the season on Wednesday. He was a picture of activity in his 34 minutes as he had a career high 15 points and six rebounds on 7-of-11 shooting. Johnson scored six of those points in the first five and a half minutes of the second half as Florida was able to extend its 33-30 halftime lead to 49-42 on his layup with 14:36 to play. Nembhard and Locke have garnered most of the attention as freshmen, but Johnson with his length can be a major factor as the calendar turns to February with March around the corner. White saw growth inside of his freshman class as Locke led Florida with 22 points as he made 6-of-11 triples. Hotty Toddy: Ole Miss obviously played well enough to win the basketball game as the Rebels lead for 17:32 in a tightly contested game that saw nine ties and 17 lead changes. Terence Davis continued his solid senior campaign as he led all scorers with 26 points, while Tyree, the SEC’s second leading scorer, finished with 20 points. Buffen is on the rise as well as he scored a season-high 15 points while playing the switch on Allen’s heroic shot to perfection. Buffen’s athleticism and his length in a 6-7 frame as a freshman is already a matchup problem as he is learning the game well at the college level. Despite Buffen’s correctness in fundamentals on the switch, Ole Miss coach Kermit Davis wished that they would have fouled, up three with the 8.8 seconds remaining.